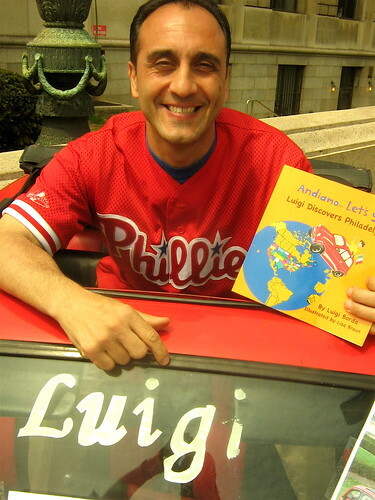 The book is called “Andiamo- Let’s Go!” and the series is called “Luigi Gets Around dot com” And the first book is called “Luigi discovers Philadelphia” I’m Luigi and this is the Philly “Phiat” and it’s the true story of me coming over in my car from Calabria Italy in 1969 on a boat like a lot of immigrants came to this country. We came to New York. We didn’t like New York because of its too fast-paced style and the truth of the matter is my cousin’s family lived in Philadelphia so we followed him to Philadelphia and there goes the skyline, our beautiful Philadelphia skyline. We settled here but it was real rough at first so we wanted to go home because people made fun of my name, Luigi. But then we started to run into people in Philadelphia. We ran into Danny and his Dodge. 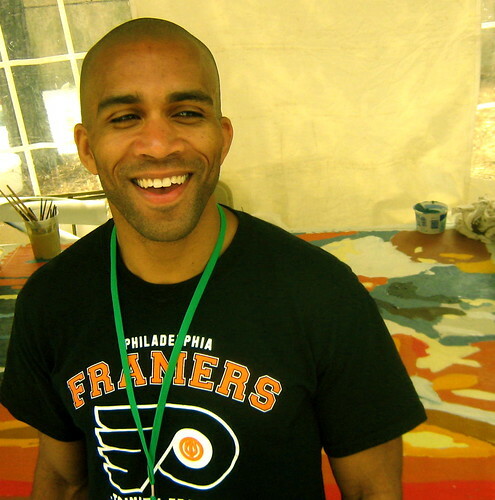 He told us to go the Art Museum Then we ran into Tracy my wife and her Triumph She said you got to check out Independence Hall and the Liberty Bell and learn about Philadelphia before we go back to Italy. And then we fell in love, me and Tracy. We started a family. Our first daughter is Angie and her Audi and she told us about the Mummers Museum which is a German tradition and my daughter’s half German. And then we ran into Veronica and her Volvo and she brought us to the American-Swedish museum. Show’em your blue eyes, Ronnie. Look at Ronnie, now look at her in the book! That’s Veronica and she gave me tickets to a Phillies game because Luigi loves baseball.” Masterman geography teacher and author, Luigi Borda.